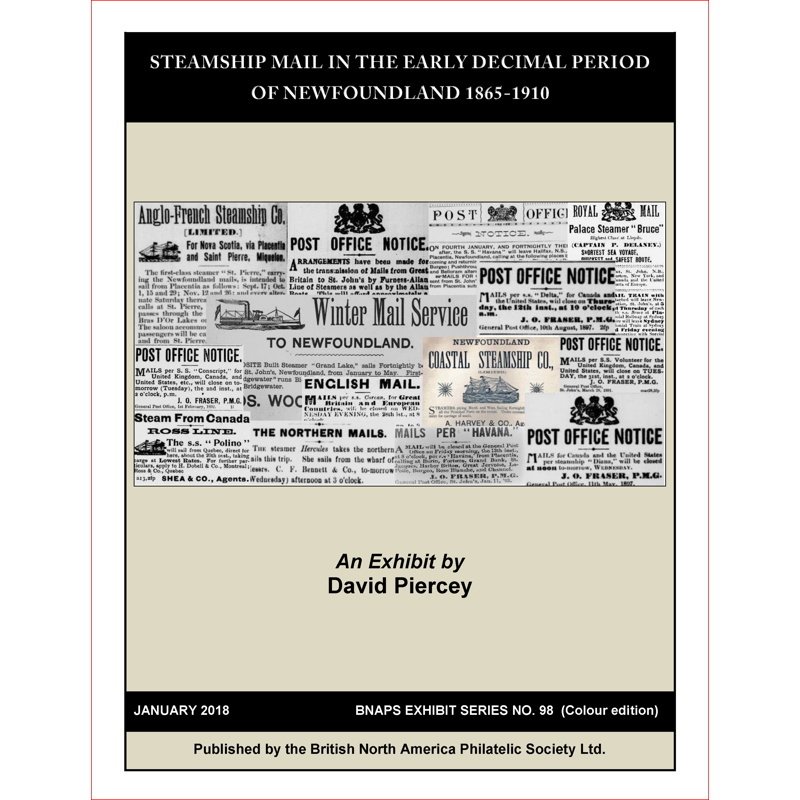 Steamship Mail in the Early Decimal Period of Newfoundland 1865-1910, by David Piercey. A major study of the coastal communications of Newfoundland in the late 19th and early 20th centuries. 2018, Spiral bound, 146 pages, 8.5 × 11, colour. ISBN: 978-1-927119-86-0. Stock # B4h923-98-1. BNAPS Exhibit Series No. 98. In Steamship Mail in the Early Decimal Period of Newfoundland 1865-1910, David Piercey presents a postal history exhibit organized by steamship routes, either around the island for domestic communication, or off the island for communication with the rest of North America or with Great Britain and the rest of the world. In addition to the difficulty of simply obtaining this scarce material, the greatest challenge in putting the exhibit together was to determine and illustrate some of the lesser known routes by which mail was occasionally conveyed off island. At BNAPEX 2017 CALTAPEX, Steamship Mail in the Early Decimal Period of Newfoundland 1865-1910 received very high awards, including a Gold medal and the Alan Steinhart Reserve Grand Award, for the depth of study and research it demonstrates. A member of BNAPS since 1973, David Piercey began collecting Newfoundland early on. His archival research undertaken to understand the routing of his covers resulted in a number of philatelic publications on early Newfoundland postal history which received several writing awards, including the Royal Philatelic Society of Canada's Geldert Medal, the Canadian Philatelic Society of Great Britain's Aikens-Hillson Trophy, the Collectors Club of Chicago's Robert Pratt Award in 2015 and 2016, and BNAPS' Vincent G. Greene Award for the best article in BNA Topics in 2016. David has been Chairman of the RPSC's Judging and Exhibiting program since 2007. In 2010 he was elected a Fellow of the RPSC. He writes the column "Let's Talk Exhibiting" for The Canadian Philatelist, and has recently also assumed writing of the "Philatelic Bookshelf" column for Canadian Stamp News. David holds a B.A. from the University of British Columbia, and a M.Sc. and Ph.D. in psychology from the University of Calgary. For many years he was a practicing school psychologist, supervisor, or departmental administrator. Retirement has allowed for increased time for philately.